The Texas Longhorn is a breed of cattle known for its characteristic horns, which can extend to over 70 inches (1.8 m) tip to tip for bulls, and up to 100 inches (2.54 m) tip to tip for steers and exceptional cows. They are descendants of the first cattle in the New World, brought by Christopher Columbus and the Spanish colonists, and have a high drought-stress tolerance. Texas Longhorns are known for their diverse coloring, and can be any color or mix of colors, but dark red and white color mixes are the most dominant. Registries for the breed include the Texas Longhorn Breeders Association of America, founded in 1964 by the Kerr County rancher Charles Schreiner, III; the International Texas Longhorn Association, and the Cattlemen's Texas Longhorn Registry. The online National Texas Longhorn Museum displays the diversity of horns found in the breed, stories about notable individual cattle of the breed, as well as a gallery of furniture made out of horns from the animal. The longhorn with the longest recorded total-horn-length marks in at 129.5 inches (3.29 m) and belongs to longhorn M Arrow Cha-Ching. This longhorn is owned by Richard Flip who lives near Fayetteville, Texas. The second longest on record is 3S Danica of Tallgrass Cattle Company, who measured in at 100 inches (2.54 m) tip to tip on September 13, 2018. Due to their innate gentle disposition and intelligence, Texas Longhorns are increasingly being trained for steer riding. Genetic analyses show that the Texas Longhorn originated from an Iberian hybrid of two ancient cattle lineages: "taurine", descending from the domestication of the wild aurochs in the Middle East, and "indicine", descending from the domestication of the aurochs in India, 85% and 15% respectively by proportion. 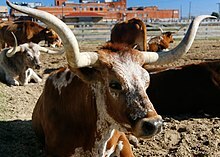 The Texas Longhorns are direct descendants of the first cattle in the New World. The ancestral cattle were first brought over by Christopher Columbus in 1493 to the Caribbean island of Hispaniola. Between 1493 and 1512, Spanish colonists brought additional cattle in subsequent expeditions. The cattle consisted of three different breeds; Barrenda, Retinto and Grande Pieto. Over the next two centuries the Spanish moved the cattle north, arriving in the area that would become Texas near the end of the 17th century. The cattle escaped or were turned loose on the open range, where they remained mostly feral for the next two centuries. Over several generations, descendants of these cattle evolved high feed- and drought-stress tolerance and other "hardy" characteristics that have gained Longhorns reputation. Early US settlers in Texas obtained feral Mexican cattle from the borderland between the Nueces River and the Rio Grande and mixed them with their own eastern cattle. The result was a tough, rangy animal with long legs and long horns extending up to seven feet. Although this interbreeding was of little consequence to the makeup of a Longhorn, it did alter color. The varieties of color ranged from bluish-grey, and various yellowish hues, to browns, black, ruddy and white, both cleanly bright and dirty-speckled. Portuguese cattle breeds, such as Alentejana and Mertolenga, are the closest relatives of Texas Longhorns. Commercial ranchers cross-breed Texas Longhorns with other breeds for increasing hybrid vigor and easy calving characteristics. Smaller birth weights reduce dystocia for first-calf heifers. ^ Siebert, Charles (July 2011). "Food Ark". National Geographic. ^ "Cattlemen's Texas Longhorn Registry". Cattlemen's Texas Longhorn Registry. Retrieved 2013-12-13. ^ "The Alan Rogers Texas Longhorn Museum". longhornmuseum.com. ^ "A $380,000 Longhorn? A Look At The Never-ending Race For The Biggest Horns In Texas". Texas Standard. Retrieved September 13, 2018. ^ "A fresh mount: Bob McCormick breaks longhorn steer to ride for bicentennial parade". Tri-Stock Livestock News. Retrieved September 5, 2018. ^ "Oklahoma couple breeds longhorns for riding". The Fence Post. Retrieved September 5, 2018. ^ McTavish, Emily Jane; Jared E. Decker; Robert D. Schnabel; Jeremy F. Taylor; David M. Hillis (2013). "New World cattle show ancestry from multiple independent domestication events". PNAS. 110: E1398–406. doi:10.1073/pnas.1303367110. PMC 3625352. PMID 23530234. ^ Rouse, John E. (1977). The Criollo: Spanish Cattle in the Americas. Norman, Oklahoma: University of Oklahoma Press. ^ Stacy, Lee (2003). Mexico and the United States. Tarrytown, New York: Marshall Cavendish. p. 233. ISBN 0761474021. ^ Barragy, Terrence J. (2003). Gathering Texas Gold. Cayo del Grullo, TX: Cayo Del Grullo Press. ISBN 9780961160487. ^ University of Texas at Austin (2013-03-25). "Decoding the genetic history of the Texas longhorn". ScienceDaily. Retrieved 2013-04-07. ^ Hoyt, Alan M. "History of the Texas Longhorns". Double Helix Ranch. ^ Hillis, David M. "Frequently Asked Questions about Texas Longhorn Cattle". Double Helix Ranch. ^ Kidd, K. K.; et al. (1980). "Immunogenetic and Population Genetic Analyses of Iberian Cattle". Animal Blood Groups, Biochemistry and Genetics. 11 (1): 21–38. PMID 7396241. ^ Donald E. Worcester. "LONGHORN CATTLE," Handbook of Texas Online. Published by the Texas State Historical Association. ^ GALBRAITH, KATE. "Symbol of Texas Owes its Survival in Part to Oklahoma". The Texas Tribune. Retrieved 2012-10-12. ^ "Texas Longhorn Cow Sells For $380,000.00". rightsidesd.com. March 19, 2017. 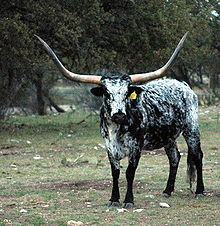 Wikimedia Commons has media related to Texas Longhorn cattle. Will C. Barnes, "Wichita Forest Will Be Lair of Longhorns", The Cattleman, April 1926. Dan Kilgore, "Texas Cattle Origins", The Cattleman, January 1983. James Westfall Thompson, History of Livestock Raising in the United States, 1607-1860 (Washington: U.S. Department of Agriculture, 1942). James Frank Dobie, The Longhorns (Austin, Texas: University of Texas Press, 1980) (ISBN 029274627X). Don Worcester, The Texas Longhorn: Relic of the Past, Asset for the Future (College Station: Texas A&M University Press, 1987) (ISBN 0890966257).